March has come and gone in the blink of an eye and spring is really starting to feel like it's arrived! Lots of fun school activities this month. Sophia LOVES her CC class and I realized that I'd not snapped a picture of her in her class yet. The boys tried "painting" (we used markers) like Michelangelo, who spent a great deal of time on his back in order to paint the ceiling of the Sistine Chapel. A trip to the BMA made me realize that I love The Walters so much better. 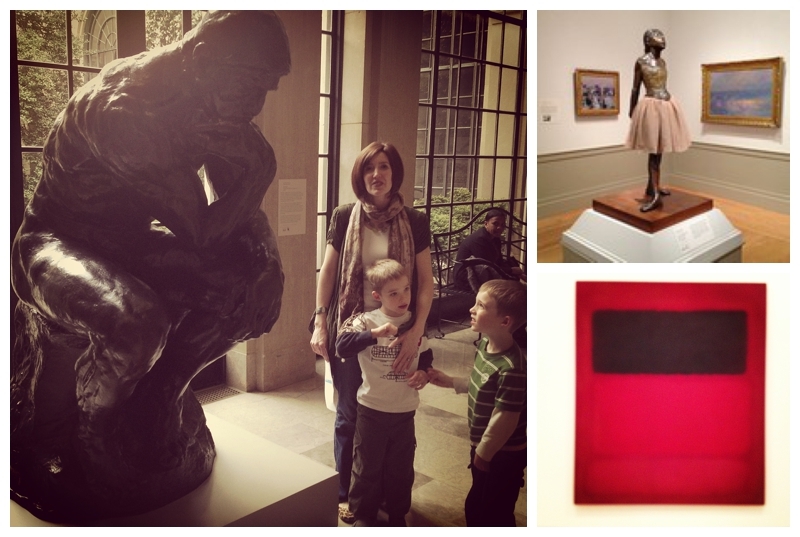 That said, it was fun to see The Thinker, a bronze cast of Degas' controversial Little Dancer (Sophia adored it) and a Rothko. I love Rothko's meditative and contemplative canvases awash with color. We've been studying classical music this month. I was surprised at how interested my kids were in Mozart's The Magic Flute. After seeing a clip, Sophia ran around singing "Papageno! Papageno!" Owen decided lipstick looked good on him. A fun night at Germano's to hear my friend sing at her first Cabaret!